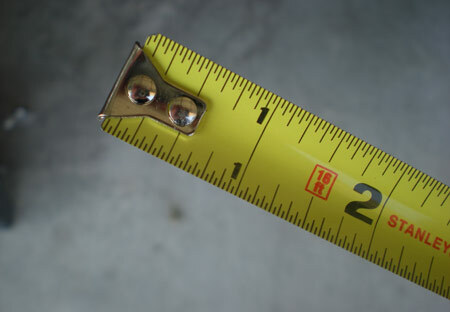 Today a friend asked me a question that the folks at Stanley tell me they hear all the time: why does the claw — you know, the little catch at the end of your short tape measure — move back and forth? Is it just poorly attached? The short answer: no, the loose claw is no accident of manufacture. It’s loose on purpose. The longer answer lies after the jump. Actually, the claw moves back and forth slightly to allow you to measure both the length of an item inside the claw and an item outside the claw. To do this, the claw must slide back and forth by a small amount — exactly the same distance as the width of the claw. That way when you, for example, push the end of the measure against a wall, the claw slides in and renders an accurate measurement to the wall. When you catch the claw on the end of a stud and pull to measure a cut, the claw slides out and again you get an accurate measurement to the end of the board. And if the claw is firmly attached and doesn’t move? Better check to see whether the tape’s calibrated inside or outside the claw before you measure or you could end up with an extra (or worse short a) 1/16″ or so. Makes perfect sense (now that I’ve read it!). I j-b welded mine in place. My whole house is crooked. Actually, only one of those statements is true. I was just teaching that to a fair number of people on site today. It’s one of those things that people don’t think about so they never know, like why framing hammers have a checkered face. You have it all wrong. It’s much easier to get the claw stuck in some small crevice where it won’t come out without ruining the tape measure if it’s free to move about a little. That way they can sell more tape measures. and drum roll for the truth. i thought it not made well, just because i found the claw with firmly attached. now, i learned. for really critical stuff I use a lufkin folding rule. THe other guys on the crew make fun of me but my miter cuts never require any corrections. One more note–check the bend of the hook to make sure it does vary the right amount inside to outside, i.e., the inside and outside measurements match (and that the corners of the hook are square). Repeated catches in cracks, drops, etc. can throw it off (it would NEVER be wrong out of the box). I think the claw test is a good way to judge if someone is an idiot or not 😛 no offense to anyone who didn’t figure this out as a kid the first time they picked up a tape measure and noticed that it was loose. This post epitomizes what toolmonger is all about. Delving deep into the construction of a common tool. When I started working – over 40 years ago – I noticed that most journeyman carpenters carried folding rules . They came (still do) with extension bars at one end for taking inside measurements – no need to bend the tape and eyeball things. — and there were vesions for brick masons as well. I think this is a good test for people who like to “brag” about how “good” they are. Although it might not matter to you (depending on your level of precision) many tape measures are calibrated differently. Last fall while we were building my friend’s log cabins we (three carpenters, aged from 46 -53) noticed that all five of the tapes we had on site (2 new Stanleys, an older Stanley, a Tajima and a Fastcap) were giving vastly different readings. The largest difference was over 1/4″. We all usually worked alone, where a difference like this would never be a problem, you measure – you cut, but on a site where one person measures and another cuts it made for some sloppy fits that had to be re-cut. We solved the problem by finding the three Tapes that measured closest and tweaking the claws so they were the same. did you notice variation between the new and old stanleys as well? One of the things I’ve noticed alot of people do is, when retracting the tape measure alot of guys try to see how fast they can get the tape measure to retract into the casing. The problem is they don’t stop or slow the speed down before the claw slams into the casing. You do this enough times and the holes the rivets go through in the tape will start to get oblonged. There goes the acuracy of your tape measure on an outside measurment. as long as this thread is necro’d anyway… Michael, if you come back to this, I actually find your story fascinating, with drywall our tolerances are pretty lax for most things but you almost always have one guy measuring and another cutting, it can lead to similar errors. As I’ve owned every brand you’ve mentioned, I’m curious to hear more details… seriously, I’m actually very curious to see how that went down. It amazes me that people are ignorant of this. Just shows you how little common sense the average person has. Scary…. I was at a hardware shop picking out a tape were all the tapes had loose ends. I asked the shop assistant why he looked at me as if I was an Idiot. Do you think I am an Idiot ? I’ve always heard that the “claw” at the end of a tape measure is called the Nibbler. I noticed a lot of comments were made by geniuses who realized the answer before they asked the question, and made fun of those who did not know the answer. I’m glad they were not my woodwork teacher or my father, as that superior attitude makes it difficult to learn. None of them seem to understand that if a tape has a loose end, it can never measure accurately between two points where the end of the tap is laid loose on a surface with nothing to hold the end. You said the long answer was available after the jump. Where’s the jump?? I see no link to the longer answer. I would always rather use a fixed metric, be it a tape with a fixed claw or a long ruler, etc. And bravo to the macho men on here who find it necessary to make fun of people for asking questions. Asking a question doesn’t mean you are stupid. In fact, many people learn by asking questions; but if questions are met with put-downs, an environment unfriendly to learning is created, which is only (temporarily) helpful to the person with the low self-esteem who found it necessary to make the put-down. Perhaps it would be best to seek psychological counseling and leave the answers to those people who know how to give them in a productive manner. Just a thought. Most people ask a question to get an informed answer, not to be made to feel like an idiot. I must say by reading many of the posted answers that the writers rank right up there with the carpet salesman who would not order the carpet purchased by my friend because her husband was not there to give his approval for the purchase. I wish it as appropriate to say what she told the salesman. BRAVO GUYS YOU’VE MADE LOTS OF POINTS.